There is a character in Return of the Jedi named "Sergeant Jad Bean". Even as I type these words, I still can't really believe it. On November 5, 2013, J H Haynes & Co. published the book "Imperial Death Star Owner's Workshop Manual", by Ryder Windham, Chris Reiff, and Chris Trevas. A follow-up to the popular hardcover "workshop manual" for the Millennium Falcon by the same authors, the book provides an encyclopedic resource of information about that dreaded battle station, including hundreds of full-color schematics, technical call-outs, photos from the films, information from the Expanded Universe, and assorted trivia. The Haynes Star Wars manuals are wonderfully fun reads, especially for us old-timers in the Original Trilogy generation. While I don't read many of the Expanded Universe novels or comics, I've devoured the 'resource' books, such as Star Wars: Year By Year, The Sounds of Star Wars, DK's Star Wars Visual Dictionary, and J. W. Rinzler's Making Of books covering the original three films. Basically, if there's anything out there that provides behind-the-scenes or in-universe information about that galaxy far, far away, I'm all over it. Did you happen to notice the text there, on the left? There was my name, my full exact name, applied to a character in an actual production photograph from a Star Wars film. Mere minutes after reading Eric's tweet, I called Ryder and thanked him profusely for this incredible surprise and honor. He revealed that he had sneaked it in as a tribute to a website I had run many years ago. Back in 2006, with no new Star Wars films on the horizon, the fan community was buzzing with anticipation for a rumored live-action Star Wars TV show. I took it upon myself to start a blog called NameItJad.com, which was a campaign to have something - anything - in the Star Wars universe named "Jad". It could have been a character, a planet, perhaps even a random part on a background spaceship. I felt the name "Jad" was suitably Star Wars-y, and after spending my entire life spelling my name for people, I thought it would be a unique way to make the name a little more common. The long-gestating live-action Star Wars TV show has yet to happen. After receiving a few "thanks, but no thanks" letters from Lucasfilm, I let the website fade away. I then focused my Star Wars fandom on the Micro Machines website, which led to meeting Ryder Windham, which led to the Name It Jad campaign actually working, better than I could have ever hoped for! The lesson here, kids, is this: Don't ask for handouts. Instead, follow your passion, make contributions, and help people. Good things will happen to you! - Is He in One of the Movies? Once the shock wore off, I set about learning as much as I possibly could about this fellow. Working with my friend and super-knowledgeable Star Wars fan Tim Veekhoven (of Teekay-421, the Belgian Star Wars Fan Club), we started piecing together everything we could find out about this scene. 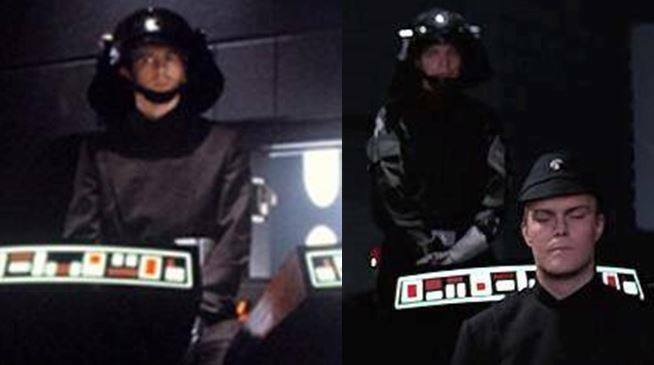 It didn't take long to determine that the original picture came from Return of the Jedi - that's Michael Pennington as Moff Jerjerrod in the foreground. Tim showed me a post from the wonderful blog starwarsaficionado.blogspot.be, and we found a black-and-white picture in The Making of Return of the Jedi. Here's the original photograph that was cropped to provide the image for the Haynes book. 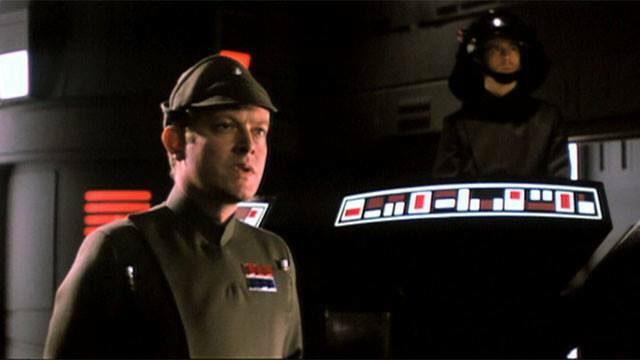 Initially, Tim and I thought that "Sergeant Jad Bean" was the trooper who was operating the round console at the moment that Jerjerrod gave the order to fire the Death Star II's superlaser on the Rebel capital ship, as seen in this screengrab from the film. This scene appears ever-so-briefly, just before Lando says, "That blast came from the Death Star! That thing's operational!" At first glance, it looks like that is Sergeant Jad Bean, activating the superlaser that wiped out an entire Rebel capital ship. He's certainly standing in the right place. However, upon closer inspection, we realized that this trooper is wearing a different uniform. The guy in the final film has white Imperial Cog patches on his shoulders just above large sleeve pockets. These costume details don't appear on the image of Sergeant Jad Bean from the book, because he is actually wearing an officer's tunic, which doesn't have these sleeve details, and which has an asymmetrical front closure. Here is a comparison picture, with the original picture from the Haynes book on the left. So Sergeant Jad Bean Isn't in the Movie? Hey, What About the Deleted Scenes from the Blu-Ray Set? Hmmm, let's have a look. We may have shown that the Bean character was not in the film, but maybe we can learn more by researching the cut scenes from the Star Wars Complete Saga Blu-Ray set. "Jerjerrod's Conflict" is the deleted scene that unlocks the mystery as to why we have a photo of a Death Star Trooper wearing an Imperial tunic behind the round console, which we don't see in the final film. This lengthy sequence shows Jerjerrod taking on specific offensive maneuvers to thwart the Rebel ships flying inside the Death Star, and taking orders directly from the Emperor to blow up the moon of Endor. And there we have him - Sergeant Jad Bean - a perfect match for the original photo which was cropped and used in the Haynes Death Star book. It's clear these sequences were designed to ramp up the tension during the finale of Return of the Jedi. They also show that the character of Moff Jerjerrod was much more developed than what we see in the final film. In rewatching these scenes, I gained a new appreciation for Michael Pennington's work as Jerjerrod. He's given a chance to display his ruthless military cunning, and yet when given the order to destroy Endor, he protests, knowing that he would be killing thousands of his own men in the process. Pennington plays the moment perfectly, highlighting the difference between the sorta-evil Empire (just following orders, sir) and the EVIL evil of the Emperor. I also highly recommend picking up the ebook version of J.W. Rinzler's Making of Return of the Jedi. In the multimedia bonus features, you'll find two videos, "Death Star Tunnels" and "Emperor Attacks Endor". These sequences show the same and alternate footage from the Blu-ray scene in a more finished state, now intercut with animatics of the Rebel ships, including reactions from Lando and the Rebel pilots. The striking thing about the "Jerjerrod's Conflict" sequence is that this character - Sergeant Jad Bean - has several lines of dialogue. We also see three other Death Star Troopers in the scene, recognizable for their giant black flared helmets. Now that my eyes were trained to look for the details, I noticed that these troopers all are wearing the jumpsuits with the pockets and white Imperial cog patches on the shoulders. Because I realized we actually DO see this arrangement of characters in the film - from a certain point of view. It doesn't happen during the final battle, but rather at the beginning of the film. It's the very first scene, in fact, and it was shot on the exact same set, although from a different angle. This is the scene where Vader's shuttle negotiates to have the protective shield lowered so that it can land on the Death Star. The camera angle is different, but it's the same set, and the same actors. 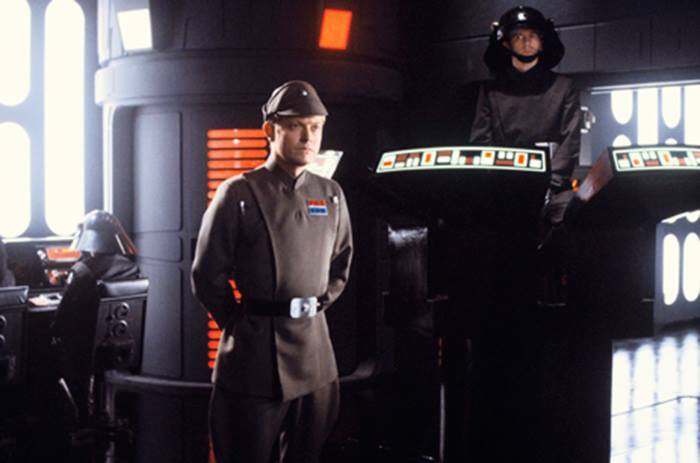 Again, we have an Imperial Officer, one Death Star Trooper in an officer's tunic (Bean), and three Death Star Troopers in jumpsuits with white shoulder patches. The only difference is that the Bean character is sitting at the low, 3-chair console, and one of the jumpsuit troopers is standing at the high round console. Incidentally, these are the same jumpsuits that TIE Pilots wear. 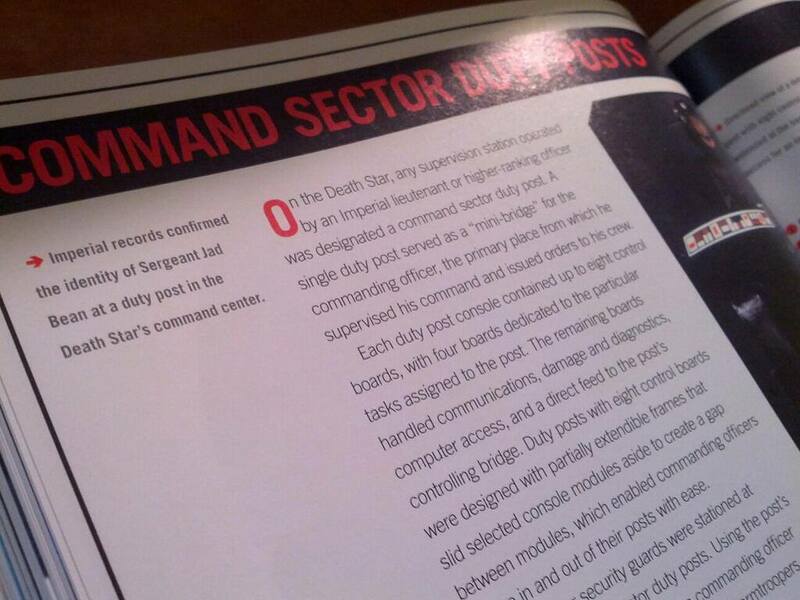 The 501st even recognizes the differences between the Death Star Trooper uniforms. If you're wearing the jumpsuit, you're an "Imperial Navy Trooper"; change to the tunic, and you're an "Imperial Navy Trooper: Dress Uniform". So there he is, right in front of the camera - Sergeant Jad Bean, speaking the lines "The security deflector shield will be deactivated when we have confirmation of your code transmission. Stand by...". 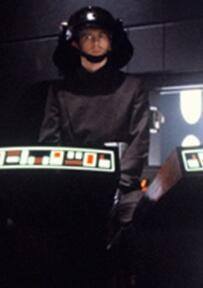 In the script for Return of the Jedi, he's listed simply as "Death Star Controller", and no other Star Wars resource has applied a name to this character. at the High Round Console in Another Scene? At this point, I'll venture away from observations, and dare to speculate. First, let's see if we can find out who played him. The credits don't list a "Death Star Controller", but the actor Stuart Fox claims to have been the guy, at least according to this page. Let's assume this is accurate. Stuart Fox is cast along with the unidentified actor who plays the Imperial Officer to work on this stage with Michael Pennington as Jerjerrod. When they filmed the "Shuttle Arrival" scene, they would have Fox sitting at the low 3-chair console. The camera is set up so that Fox is in the foreground, where he speaks his lines about deactivating the deflector shield. To his right are two jumpsuit troopers, with a third standing in the round console behind him. Then, when it comes time to film the "Jerjerrod's Conflict" scene, they move Fox to the tall round console - specifically because the part required an actor to deliver dialogue to Pennington. Thanks to the deleted footage from the Blu-ray set, we can confirm there were three jumpsuit troopers sitting at low console. I would even go so far as to speculate that Stuart Fox was given a tailor-made costume, whereas the other extras were wearing baggier, "off-the-shelf" TIE Pilot jumpsuits. Sergeant Jad Bean. A Character in Return of the Jedi. Be sure to read Ryder's article on the official Star Wars blog about the story behind the book!